Reece’s counts were up for the third day in a row, so he was able to leave the room today. He signed up for playroom time, but decided he didn’t want to play. We ended up doing a couple of wagon rides and some hall-walking. His legs are getting pretty skinny, so I am pushing him on getting out of bed. The GVHD test came back as essentially positive. I say “essentially” because they never tell you anything definitively here. So he stays on the steroids for at least 10 weeks. He is actually feeling and acting more like himself since starting the steroids. Of course, I was thinking we were getting a handle on things. My realization of my naiveté came when the endocrinology fellow came to consult with me about putting Reece on insulin injections. Yes, you read that right. Apparently, the steroids cause glucose levels to be very high and, in most kids, they need insulin to regulate it. My husband said it best, “I love how every solution causes other problems.” I was not very cordial with this woman; I wasn’t rude either, I was flat. It didn’t help that I wasn’t aware of the consultation ahead of time and that she didn’t introduce herself other than just barging into the room. She had the nerve to say to me, “You look alarmed.” Really? I was thinking I looked refreshed and calm considering the breezy nature of being with my son as he is going through BMT. She then asked all about Reece’s health history and our family’s health history. I can see the diabetes health history, but I am pretty certain she can look the rest up. For goodness sake, we have been here for nearly two months. Long story short, Reece’s blood glucose level is too high, so he will be getting insulin shots over the next 24 hours and from there they will determine how often he gets them, based on what his blood is saying. We are dreading this whole deal. It’s not the end of the world, but after everything else, it is just one more added (and highly stressful) thing to have Reece do. The good news, if you want to call it that, is that after the steroids are done, he will be able to taper off the insulin. This is such a chew-you-up-and-spit-you-out process. We could use a lot of prayer on this–no need for insulin and a way to make it less stressful for Reece if he does need it. I was so naive when we started this process. I am glad that I was naive, too, because to say you are not naive means you have been through this before. Unfortunately, there are parents and kids up here that are not naive when they get here. And the statement, “Ignorance is bliss,” is so true. The longer we are here, the more I know and the more I know, the more stressed I become. And the more inquisitive I become. And the more feisty I become. And I am just a wee bit pregnant, so I emphasize that last part about being feisty. The reason I bring this up is that I just did not expect all of the things to crop up like they have. I knew there could be side effects and I knew this was going to be long, but I had no idea what we were in for and that is probably a good thing. This has led me to question just about everything–from my faith, to my role in life, to how I view the world, my kids, my family, my health, and God Himself. I can not, for the life of me, figure out where God’s going with this. I was much more trusting at the beginning and much more willing to give things over to Him. Now I feel like there is a line between what I know about Him through faith and what I am experiencing about Him through life. I have never been at odds like this before and I wouldn’t go so far as to say I don’t trust Him…I just don’t “get” Him. I find Him more mysterious than ever. Oh and I really, REALLY wish there was more written on Mary–mother-of-Jesus, Mary–so I could understand how in the world she watched her son suffer. Because when I think of God and how Jesus suffered and how He had the power to do something about it and didn’t–I can not relate. I know what a gift Jesus gave us, I know we are saved only because of it, and I suspect part of the rationale for having the price being paid that way was so that we as humans can understand what a price it really was. But, as a parent, I can not relate. I need Mary’s autobiography to hear how she did it as a human. Clearly, God chose her knowing what she would have to endure. I want to know what she thought of God–if she doubted Him or was at odds with Him. I do know this; I still have faith. And I know I have faith, because I am well aware that God will do what He has set out to do, regardless of how I feel about it. I don’t believe that faith is about getting what you ask for and having your faith grow because you got what you wanted. Faith is about asking for things and knowing full-well that God could give them to you, but may not, and still believing in His love and goodness. It’s about having trust in Him, despite His answer. Still, I just don’t get it. I used to think the toughest person I had ever met was Jim Lovell. He is the astronaut that Tom Hanks portrayed in the movie “Apollo 13”. I remember shaking his hand and thinking, “This man flew to outer space, was put in a highly life-threatening situation, and despite all odds, figured out a way to get back home.” Now, he takes second place to the toughest person I have ever met–my son. Within five minutes of my arrival, Reece had worked himself into tears. I have no idea how this happened–one minute he was fine and the next minute it was as though the world was coming to an end. Terry left the room to shower and get ready for work and during that time, we had several bouts with tears. He is also very itchy today, so he is struggling with that. (He thinks it is unfair that I don’t want him to itch, but if he starts bleeding, it is a big problem.) The itchiness is compounding the emotional factor. When Terry got back into the room, he basically was throwing pillows at both of us and not wanting anything to do with us. Then, he told me he wanted to watch a movie, “Thomas and the Magic Railroad”, which was, of course, the one thing I forgot to bring from home today. More tears. Inconsolable tears. (Remember, he has been pretty much flat-affect for the last month.) This, I suspect, is good practice for our years with two teenage daughters in the house. Anyway, Terry left the room to grab a coffee and Reece was somewhat more calm. Then he began crying again, which made me cry. When he saw me crying he told me he missed Daddy. Terry got back to the room and the doctors showed up for morning rounds (they round just outside of the rooms in the morning and inside the rooms in the afternoon). I stepped outside thinking that Reece didn’t want to see me anyway and not 30 seconds later, he was wailing and calling my name. He did want to read a book after that and now he is comfortably watching a movie. So that is what they mean by “moody”? It could be a long 10 weeks. Reece’s counts improved yesterday, but were slightly down again today. The doctor thought perhaps one cord is winning out over the other, which would suppress his counts somewhat. He ordered another engraftment study. We’ll get the results for both the study and the biopsy in another day or two. I am hopeful that Reece will be up for some visits with some of his pals soon. He has been talking more about other kids, looking at Valentines gifts and other things that kids have sent to him, and he has agreed that he would like to see some people. He hasn’t wanted to see any kids until recently, so this is a good sign to me. We’ll see how the rest of the day transpires. We’ve had a decent weekend up at good ol’ Amplatz Children’s Hospital. Reece’s rash is–well, it’s a rash. They haven’t done a biopsy yet, thinking yesterday that it looked better than the day before. I was hoping he only would have to use creams to clear it up, versus IV steroids. Well, today, they told us that it looks worse and he will likely have a skin biopsy tomorrow. Additionally, they will start him on IV steroids until they get the results back mid-week. I am sure it is GVHD. And, quite frankly, we knew that this would be a higher risk doing the double cord transplant. This specific type of GVHD, in fact. My thought is, if he is going to need to be on steroids, then let’s get it over with and get it started. I felt the most encouraged I have in weeks when Terry and I had a full six hours with Reece yesterday morning and he smiled, laughed, joked, and interacted with us throughout the entire time we were with him. It was like a cool rain over a dry, scorching desert. It felt so good to talk with him and get him to smile. He even told us that he wanted to see Britta! So this morning, we packed her up and brought her over. I was a little nervous that she wouldn’t recognize him. The last time she saw him, he looked like himself. I showed her a few pictures of him from the last week and told her he didn’t have any hair. (She was scared of Terry the first time she saw him with his head shaved.) She walked into Reece’s room, walked past his bed, and smiled at him the entire time. It was adorable! Reece had a huge grin on his face, too, and he invited her to sit on his bed and get under the covers with him. She wouldn’t get under the covers, because she still has her two-year-old attention span and she wanted to get down and play after spying some of the toys. But still, Reece hasn’t wanted to see any kids, including Britta, in weeks. I felt like it was a good sign. All smiles as Reece and Britta reunite after six weeks apart. Reece’s blood counts are being suppressed by something–they aren’t sure if it is some of the drugs he is on, if the cord cells are battling it out, or if there is some virus that is at work. It is very frustrating and disheartening. What Would Reece Be Saying? I’m posting a link to a clip that Terry found on the LIVESTRONG website. Pardon the title–the rest of the video does not contain expletives. I appreciate this guy’s sense of humor about a very serious topic. We, as parents, can relate to a lot of what he is talking about as we have observed Reece going through this process. Reece has reacted in a similar way to much of this, but of course he hasn’t said a whole lot. It feels good to chuckle about some of this stuff. It also reassures us that there are others who can relate to Reece’s experience. We are by no means trying to be disrespectful of anyone going through cancer treatments or BMT. I made it back to the hospital today–four days away–I have missed a lot. As I have explained in the past, everything is intertwined in this process. Reece no longer looks yellow from jaundice, but he is now red over parts of his body from a rash. They are treating him with steroid cream, hoping it will take care of things. If the rash hasn’t improved in another day or so, they will test him for GVHD of the skin. If that comes back positive, it will be 10 weeks of steroids. His fevers have decreased, his weight is somewhat down, his white counts are down. The white counts being down means they are so low they are near where they were when he first started having them come in a few weeks back. This is relatively normal, I am told, but he can’t leave the room today because his ANC (neutrophils) are too low. Neutrophils fight infections. He has been able to leave the room for a couple of weeks now, so this feels like a setback. They are going to take him off one of his immunosuppressive drugs (a drug that helps his body not fight off his new blood cells) to see if the counts rebound. The problem with doing this is that if he has skin GVHD, he will likely need to go back on this drug to assist in his body accepting his new blood cells, thus helping fight off the GVHD. The good news is his blood is 100% donor, so they aren’t worried about his counts, other than they want to see them go back up. The other piece that we have to consider is that he isn’t 100% fever free, which may be his body fighting off some sort of infection. Infections use up white blood cells. So, they have switched around some of his antibiotics in an effort to help his WBC. Hopefully, that all makes some sort of sense. I went on a walk around Lake Harriet today to get my body moving, get some fresh air, and get my sinuses cleared out. This winter has been awesome as far as weather, so being around the lake felt normal and refreshing. My Ipod pulled up my new favorite song, “Somebody That I Used to Know” by Walk Off the Earth. Great song–it’s actually all about breaking off a relationship with someone. Being happily married, I can’t relate so much to that part of it at this stage of my life, but the harmonization is great and I love the sound of male/female duets. As I was chatting about the song with my friend, she asked me if the song spoke to this time of my life at all. I told her no, but after we got off the phone, I realized I was entirely wrong. That song actually hits home in the way I feel about life in general right now. I can’t go back to the way things were and I really loved the way things were, but that isn’t our reality anymore. It has some similarities to the feeling of breaking up with someone–even though you care about someone, you have to go your separate ways. Everything seems so off from my family being split apart, to our house feeling empty, to the way I feel being pregnant and cumbersome in my own body. It makes sense that the song resonates with me. And in some way, I knew that things were about to change before everything came crashing down last fall, just like you do when you know someone is about to break up with you or you need to break things off with them. I knew last summer when I was starting to plan the MOPS year with my good friend, Tammy, that there were big changes in the wind for our family. It manifested in a very unsettling feeling about my coordinating the MOPS year with her. It had nothing to do with her or my personal ability to do it–it was more an uneasy feeling that I wouldn’t be able to meet the commitment due to something unforeseen. I remember telling her, “I can tell there are big things in store for my family this year.” This was after I found out I was pregnant, so I was sensing it was more than that, but trying to not read too much into it. Then, within the course of a 48-hour period, both our pastor’s sermon and our bible study lecture were about letting God take the “wheel” in life and allowing Him to be in control. I knew this was something I needed to do and during my prayer time, I asked Him to do this for me or at least point out the areas where I was failing to do so. These messages were given only a couple of weeks before our fateful Urgent Care visit. So when this whole blood-testing thing started gaining momentum, I knew in my heart that it wasn’t going to be an easy road, but it was a road we would be walking down. It doesn’t mean I don’t stop, turn around, and longingly look back at the path we came from and want to return to it. I was hoping the whole “allowing-God-to-be-in-control thing” would be a more gradual transition, but He basically booted me over to the passenger side, jumped in the driver’s seat, and slammed on the gas. Now I feel like a parent who is teaching their teenager to drive and yelling, “Are you CRAZY!? !” while they speed down the highway. Only God isn’t crazy and He is the Parent, so I guess there is nothing to do but hold on and trust Him that we’ll make it there in one piece. Thankfully, I have a couple of things that are keeping me sane. First, I am pregnant, which requires that I take care of myself. As I would do anything I could for any of my kids, so I would do that for myself to help one of them out–if that makes sense. Eating well, sleeping, exercising–it has to happen to stay healthy and to keep the baby well. Second, I have a very active and engaging almost-two-year-old, who pulls us out from the seriousness of Reece’s situation and back to the reality of the rest of life. 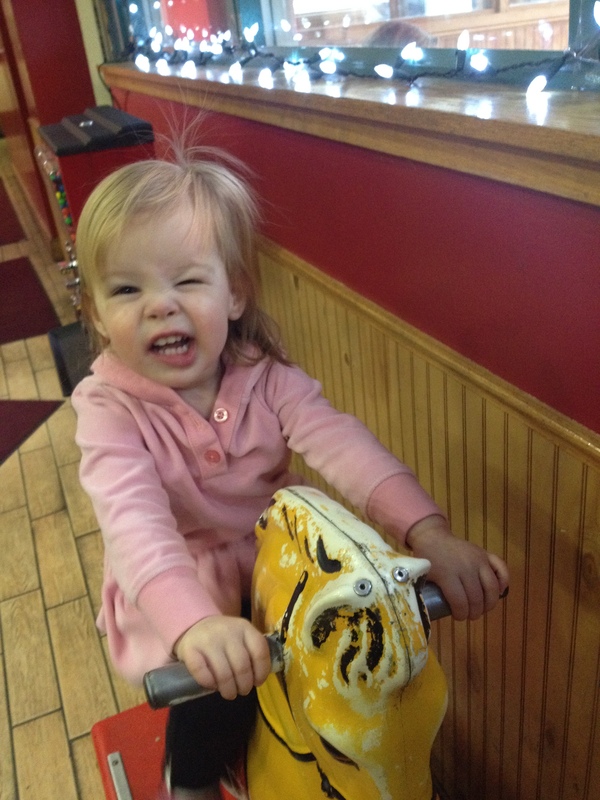 Here’s a picture of Britta from a few weeks back after we took her to The Egg and I for breakfast. What a little monkey she is and she brings us such joy! Of course, she has changed a lot since Reece was admitted to the hospital–she talks a lot more, shows bigger emotions…she is close to two and it is shining through. I am so grateful that we do have her as an anchor in life to balance things out and force us to be normal with her. She isn’t old enough to understand what is going on and I find that to generally be helpful. She doesn’t ask questions about the situation, she behaves the way she would no matter what is going on. Third, I married the right person; he’s an awesome husband. Early on in this journey, someone actually e-mailed me with the best of intentions to warn me about how marriages can fall apart during times like this. I was a bit put off by the e-mail, but I know they meant well in saying this to me. (That whole rule stating if you don’t have anything nice to say, don’t say it at all…brilliant advice!) Yes, we have had some trying moments and said some things in stress-related arguing. That, however, has been pretty minimal. The truth is, we have had bigger disagreements about things of much lesser importance. Our marriage isn’t perfect, but I have found in some of our most stressful life moments, we have been able to put our differences aside and come together to support each other. I would go so far as to say this circumstance has brought us closer together. Every storm we weather together binds us closer. As humans, we look for similarities in others that we can relate to as a way to form friendships. How is it any different in a marriage? Things will either eat at you and rot your relationship or you endure them and share an even closer bond than before. He has taken the overnights (with some relief from my mom) at the hospital without complaint. He has rearranged his work schedule and not asked questions. He manages to balance our budget and finances so that I don’t feel stressed about them. And–this is a big one–he listens to all of my yapping without (well, with very little) complaint. Yes, he is the person I want to experience all of life with–I am so grateful that painful endings in other relationships led me to him. Fourth, I have a strong support network of family and friends. They are awesome. My parents, Terry’s parents, my aunt, my extended family, my dear friends, and all the people from all over the place lifting up Reece and our family. Lastly (but definitely not least), I have hope that my son will pull out of this, that he will heal and be restored. That he will live a normal life again. And where is my faith in God in all of this? It’s there. Just chillin’. It is safe to say that I don’t “get it” as far as where this is all going. I know God is near and aware. I find myself scanning the room at times and envisioning where exactly He is at. I just don’t get it and when I get to Heaven someday, I have some big questions for Him. I hope I get some answers before then, though. Reece’s ultrasound from Monday showed clear results, as expected. He is doing about the same as he was a couple of days ago. He is having an allergic reaction to the medicine, he has jaundice, he has intermittent fevers. None of these things are surprises for the doctors; they are all typical with BMT. He has shown an interest in doing some more playing, although it is in short spurts. I have not been at the hospital in the last two days as I am battling a cold. I got the boot to go home and try to get well. Therefore, I have not seen him firsthand. My mom and Terry have been covering the last couple of days. It is really hard to be away from the hospital, but I finally spoke to the doctor via phone this morning to get a rundown of Reece’s status. Posting on Reece has gotten to be tough for me. I want to be positive, as I think he overall is doing well. He is basically holding steady, with different things resolving and cropping up at the same time. We are in a holding pattern at this point, but without physically being with Reece, it is difficult to describe how he is doing and what it actually looks like. It has also become difficult to post as I don’t want to be a negative person; I do, however, want to be realistic. And I am in a rut with the whole thing mentally. I am trying to avoid making this site be a venting, negative, down-in-the-dumps thing. I don’t want people to feel sorry for Reece or us. So there are some days where I haven’t been posting, because I am trying to avoid all of that. But in being “real” about the whole thing, I can’t avoid sharing what the emotional heaviness feels like. After spending two days at home, I have realized that I am personally in some sort of grief state right now. I know we haven’t lost Reece, but he looks and acts nothing like the child we know as Reece. I miss him so much–his personality, his energy, his non-stop talking. I feel like I am losing my mind at times. He is here with us, but he is not. It has to be some form of grief–I have never experienced anything like this. There is nothing I can draw a comparison to and there is nothing anyone can do about it. It just is. It’ll be okay, but the reaction has taken me by surprise. On a positive note, the basement project is finished, the house and carpets are cleaned, and Reece was able to Facetime with me the other day to see the new addition. Preparations are coming together and now we just need to get our plan for the summer down. I am working on finding a full-time nanny starting the beginning of May (or sooner, if available). I basically need someone to help me out with one or two kids and be at home with us (M-F) to fold into our family dynamic. If you have a recommendation, please let me know. Send an email to help4reece@gmail.com. Thanks!